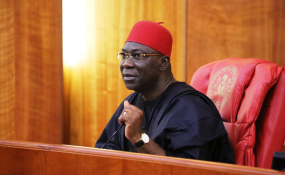 Abuja — The federal government Wednesday approached the Federal High Court in Abuja, for an order to temporarily freeze properties and assets linked to the Deputy Senate President, Senator Ike Ekweremadu. The applicant is therefore asking for "An interim order of this Honourable court temporarily attaching/forfeiting the properties listed in schedule B hereunder to the federal government of Nigeria pending the conclusion of further inquiry/investigation by the Special Presidential Investigative Panel for the Recovery of public Property and or possible arraignment of the respondent. "And for such other orders as the court may deem fit to make in the circumstances of the case. "Some of the grounds on which the application is predicated are that the properties listed in schedule A were the properties declared by the respondent in his asset declaration forms at the Code of Conduct Bureau (CCB). "That ongoing investigation/inquiries have revealed that the properties listed in schedule B also belong to the respondent and so belong to him when he declared his assets in schedule A. "That the properties listed in schedule B were not declared in the assets declaration forms of the respondent. "That preliminary investigation by the applicant reveals that a prima facie case of breach of Code of Conduct for Public Officers has been made out against the respondent. He said: "This is clearly part of the politics of 2019, and is further exposing those, who colluded with the dismissed former Chief Judge of Enugu State, Justice Innocent Umezulike and his cronies to steal and doctor his will."